Identifying gold and silver at yard sales and thrift stores can be challenging, which is why even experienced thrifters constantly overlook hidden treasure! I have found quite a few marked gold items and sterling silver in some very unlikely locations, especially at thrift stores like Goodwill and Salvation Army. 95% of all karat gold and sterling silver jewelry manufactured after 1906 will be marked with its purity somewhere on the piece. However, these marks are overlooked ALL THE TIME by yard sale hosts, thrift store employees and internet sellers. The marks can be tiny. They can be hidden inside rough textures, worn down to the point of being almost unreadable, or the marks may be unfamiliar to many sellers. The more experience that you have looking at jewelry marks, the more likely it will be that you will be able to identify gold and silver pieces with markings that others have missed. 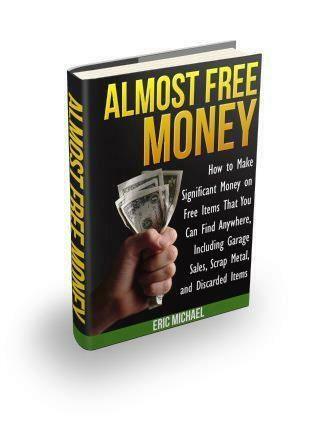 It also helps a ton to have that experience with the physical characteristics of gold and silver. Mark my words… you will see a piece of jewelry at a yard sale and you will say, “That’s sterling silver. It’s gotta be!” The piece will just look and feel like sterling silver, but you will not be able to find the mark. It’s happened to me multiple times. You have to be patient and look at the item in direct light. This is where your lighted loupe can earn its money and find a mark that was missed by many other yard sale flippers. The mark will be there, you just have to find it. Purity marks for gold items and maker’s marks are often stamped on pieces of jewelry in similar locations. While you are conducting your research prior to starting to locate gold, look at as much gold and silver jewelry as you can. Look at new jewelry and antique jewelry and compare and contrast how they are marked. Notice what the marks look like after jewelry has been worn frequently. After looking at many pieces of jewelry, you will learn where to look for the marks, so that if the mark has been partially rubbed off, you can still see remainders of the marks. This is the #1 source of my “hidden gold” finds at yard sales and thrifts. Gold Earrings: The easiest marks to see are usually on the backs, but the original earring backs are often lost or swapped with costume jewelry backs. Most of the 14K earrings that I have found have been located by looking at the tiny marks on the posts of the earrings. These can be tiny and faint and may not be visible except in direct light using magnification. When you start going through earrings, get out your small magnifying glass. Because these marks are so far to see, you can find a lot of gold earrings. They don’t weigh much, but it all adds up and they will probably only cost you 25c or so. Earrings are also located quite often because when people lose one earring, they discard the other earring into their costume jewelry pile and it ends up at the yard sale. You can also get quite a few gold earrings by asking yard sale hosts if they have any unmatched gold earrings that they would like to sell. Gold and silver rings and solid bracelets: Rings and solid bracelets are always stamped on the inside of the piece, usually at the bottom for rings. Occasionally, you will see rings stamped underneath the stone in the hollowed-out area. This is a good place to look for pieces that others have missed. If the mark is under the stone, it can be difficult to see. The best way to find hidden gold rings is to look for well-worn rings and then look for a hint of a purity mark. These can be very difficult to see, which is why they are often missed. Look for the characteristics of gold and silver on pieces that show signs of frequent wear. Sometimes, you can catch just a shadow of a mark. I have even bought rings that I suspected to be gold for $1-2, but had no visible marks and then took them home and tested them to confirm that they were indeed gold. Also, look for rings that have been re-sized, as this often removed a good portion of the purity mark. Another source of Almost Free Gold and silver is class rings. I think that yard sale hosts think that because the rings bear their name and/or school name, that nobody else would want the ring. I have bought several 10K gold class rings for under $5. You can also ask yard sale hosts, “Hey, you have any old class rings that you want some cash for?” Many people don’t even think about selling them at their yard sales and usually they don’t want them after they are out of school for a couple of years. Gold and silver necklaces, chains and bracelets: Jewelry that has a latch is usually marked on the clasp and also sometimes on a tab that is connected to the clasp. Again, these marks can be tiny on pieces with very small clasps and on children’s jewelry. The marked tabs are also frequently lost. Gold and silver charms: These are a great source of hidden gold and silver, because a lot of flippers will look at the bracelet or necklace for marks and then move on. That is where you swoop in and make a score. It is common for people to put marked gold charms on costume jewelry chains or bracelets. Single marked gold and silver charms are regularly received as gifts, and if the recipient doesn’t have a fine gold necklace to put them on, they use whatever they already have at home. This is especially true of children’s jewelry. I have found 14K gold charms on bracelets that contained 20 other costume jewelry charms and I have also found a number of gold charms on costume jewelry necklaces and even on rope or leather bands. Look for professional sports logos and zodiac sign charms for sources of real gold and silver. It is also worth noting that vintage charm bracelets and charms can fetch excellent payouts on eBay, even if they are not karat gold or sterling. Gold and silver watches: The marks on watches can be hard to find. Sometimes they are stamped right into the back of the watch on the outside of the watch. But, they can also be stamped inside the back and you have to remove the back of the watch to check it. They can also be marked on clasp of the watch. I have not found a gold or silver watch yet, but I have read that the PM buyers that have found them look for brands of watches and then check them out closer. It is extremely important that you know what the marks on gold and silver mean, so that you can determine its value. Identifying gold is usually fairly straightforward. All modern jewelry items over 10K in the US and 9K in Europe are required to be marked somewhere on the piece when the pieces are made. 95% of all fine gold jewelry items found in the US and North America will be plainly marked with their karat designations – 10K (or 10Kt), 14K, 18K, 22K or 24K. One type of mark to look for that is sometimes mistaken for gold plate is a decimal mark, which is used more in Europe. You will sometimes see 14K gold marked ‘583’, 18K marked as ‘750’, and so forth. 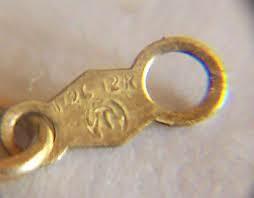 Rarely, you also see antique gold jewelry marked as ‘Plumb’ or with a ‘P’ after the purity mark. Plumb means that the jewelry contains the exact purity marked on the piece. 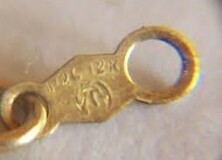 Sometimes, you will see these gold items marked ‘14KP’ missed, because other buyers think that the ‘P’ means ‘Plated’, when it really means ‘Plumb’. You may also see gold jewelry marked 14 KY or 14 KW. The ‘Y’ and ‘W’ denote coloration of gold (Yellow and White gold, respectively). For more details on gold quality marks, see http://www.jewelry-auctioned.com/learn/buying-jewelry/how-to-understand-the-meaning-of-gold-hallmarks. It is important to understand what some of the other marks on gold jewelry mean. Many cheaper gold-colored pieces and costume jewelry are not pure gold. Instead they are only gold on the extremely thin outside layer of the jewelry. Filled gold is the most valuable of these types of gold jewelry items. These items are marked 1/10 10K or 1/20 14K, indicating that the gold content is 1/20 gold of 14K purity. In other words, it has some gold content value for larger jewelry pieces like chain necklaces, but there is much less gold than even 10K gold. The jewelry with the smallest percentage of gold is gold plate, or gold electroplate (GE, or HGE for heavy gold electroplate). These pieces have very thin coatings of gold, sometimes only millionths of an inch thick. Remember that all gold has some value. HGE pieces can net you some profit if you can get them for free or under $1 at a yard sale. For more information on plated gold and a source for buying HGE and filled gold, check out http://www.watchbatterybuyers.com/gold-plated-gold-filled-recycling.php.